The 1 Billion Meals Challenge* aims to provide 100 million meals per year through 2025 to families struggling with hunger in the United States. Now in its fifth year, the campaign has provided more than 420 million meals to people in need through Feeding America’s network of 200 food banks. Tony has committed a lead gift to support Feeding America and the 1 Billion Meals Challenge. Help match this gift to double the impact for kids and families in need. Join the Challenge today! *Formerly called the 100 Million Meals Challenge. Every $1 donated helps provide at least 10 meals for families facing hunger through the Feeding America network of food banks. 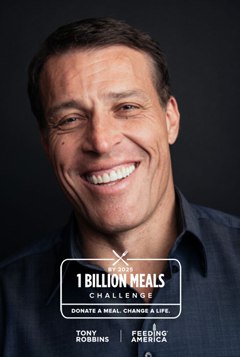 Tony Robbins has committed a lead gift to support Feeding America and the 1 Billion Meals Challenge. This amount, along with gifts from other donors, will be used to double the impact of gifts made in response to designated campaigns through December 2024. Gifts received after the campaign or in excess of this amount needed to reach the 1 Billion Meals Challenge goal will not be matched but will still help provide food and groceries.